Bill Moore, president of Moore Associates, discusses recovered paper markets outlook during Stifel conference call and expresses “cautious optimism” for OCC markets moving forward. Over the last couple months—and since China launched its ban on certain recycled commodities—a lot has happened in the recovered paper markets. And according to Bill Moore, president of Moore Associates, there is more to come. During a recent Stifel Capital Markets conference call, Moore says he remains “cautiously optimistic” about old corrugated cardboard (OCC) markets moving forward. He also reports mixed waste paper (MWP) is at an all-time low and that demand is strong for finished paper product to be converted into boxes. 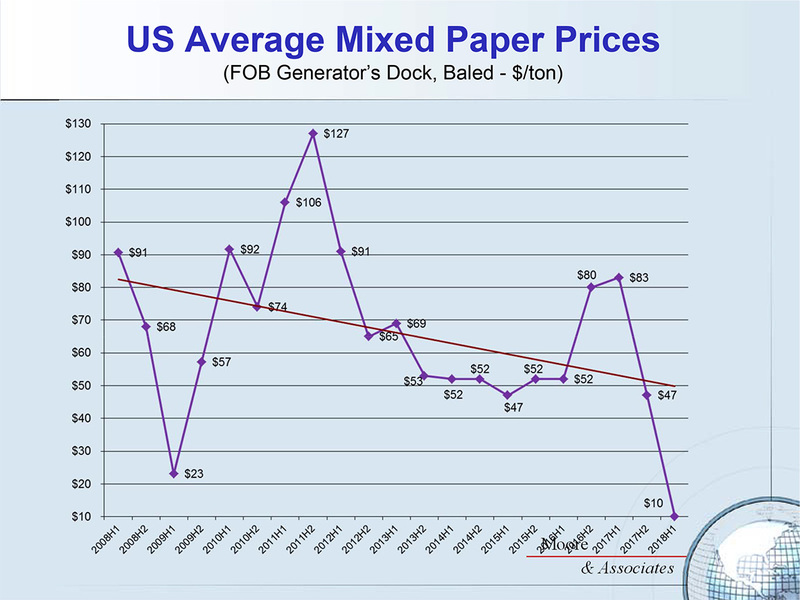 Regarding mixed paper prices, Moore points out that since prices for the first half of 2018 are well down, they have subsequently pulled the whole trendline down. 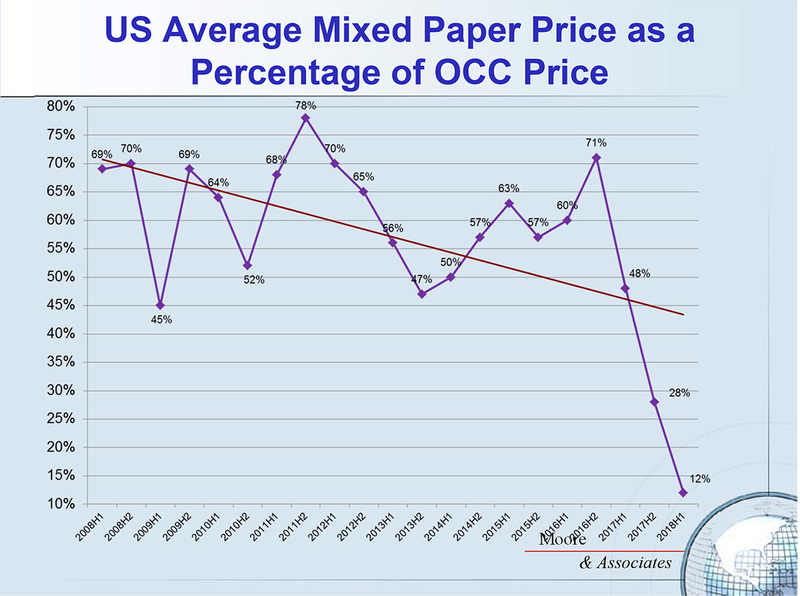 When looking at relative prices of mixed paper to OCC, Moore also points to a downward slide that has been going on for a year now—it’s one that is stuck at the 12 percent range. Comparing that to the previous 10 years before 2017 when China was strongly buying, the mixed paper market averaged in the 60 percent range. Moore points out that domestic demand for OCC has been strong, while exports in China have been weak. One of the things he believes is slowing the market down is the additional OCC coming from the solid waste sector and the materials recovery facility (MRF) sector because of separating as much OCC as possible from mixed paper. In addition, the OCC level and mixed paper coming into MRFs is increasing due to e-commerce. “But because of the very low values and difficulty moving mixed paper, the MRF guys are energized to produce as little as possible, and that’s created some extra OCC supply, which has held prices down in the second quarter,” says Moore. And so is the global business, notes Moore. Multiple startups are developing in Europe, and new startups are coming into Southeast Asia. It is also worth mentioning that just last week, there was a continued announcement of more downtime in the China board and container production industry because they are short of fiber, notes Moore. To date, there’s only been one company, in Australia, that’s been a big user in mixed paper in its eastern U.S. mills. And that company has another mill planned in Ohio that’s currently under construction. In addition, offshore interests, mainly China, are looking at putting systems into the U.S. to make pulp from mixed paper, according to Moore. He also adds that the recent Nine Dragons’ purchase of two mills in the U.S. indicates that China could change its mind on the imports of mixed paper. Both Chinese and traditional U.S. paper producers, developers, as well as collectors of MRF processors are examining whether they should vertically integrate backup in the chain to produce pulp, and that includes players in the solid waste industry, says Moore. So, who would use this pulp? However, Moore points out, there is a growing concern that if China is banning U.S. mixed paper from coming in, then other Southeast Asian countries will also push back. And some of them—namely Thailand and Vietnam—already have. Another question Moore raises is whether the MRFs maximize OCC removal from the incoming stream, which is what’s going on right now. Could that be the new revenue model? Possibly, notes Moore, but the high OCC content in mixed paper makes it a more usable pulp as the OCC strong-craft fibers are what people seek the most from the mill and product performance. 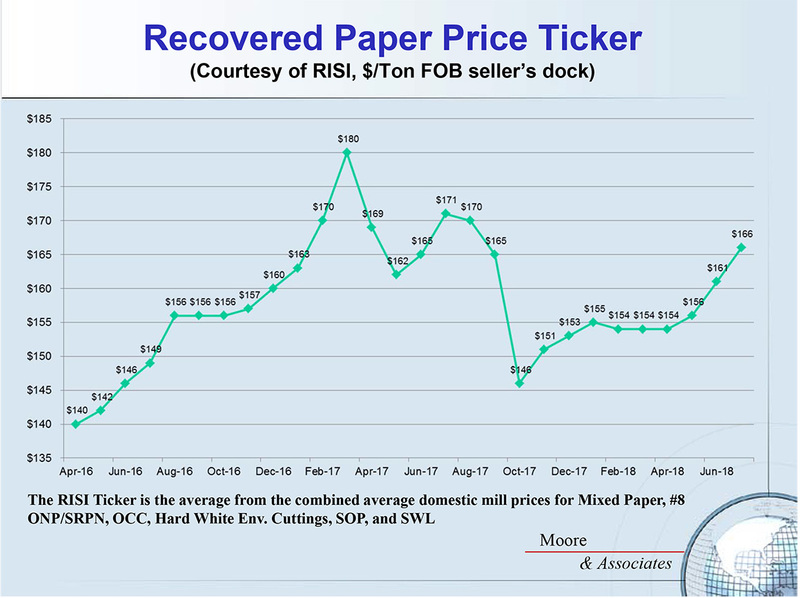 Moore explains that there does not seem to be a trend to convert high-quality OCC into pulp, but that, too, may come to pass as China may ban outright all imports of RCP (recovered paper) by 2020. And there is no relief for the 0.5 percent contamination standard, he adds. Michael E. Hoffman, environmental analyst at Stifel, further highlights some key points from Moore’s discussion regarding China. What could that mean for solid waste service companies? “These trends fit our narrative that the recycling issue is a fiscal year 2018 event, and in fiscal year 2019, we get back to focusing on really good solid waste fundamentals,” he adds.